I've covered horror, fantasy and crime so far, but haven't really hit on scifi yet. So thought it would be appropriate to bring in Edmond Hamilton's CAPTAIN FUTURE, who had his own magazine for around 17 issues and then later was run in STARTLING STORIES for another several issues. 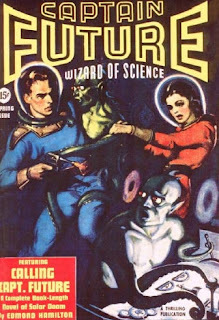 Hamilton was in the pulp business from early on and started with a space opera before Captain Future called THE INTERSTELLAR PATROL which ran in WEIRD TALES. This series has been collected into two books (CRASHING SUNS and OUTSIDE THE UNIVERSE) that are both easily available at most online used book stores. There are of course many scifi pulps out there, and most considered more adult and "respectable" than the CAPTAIN FUTURE series, but I like my pulp to be... pulpy and not so high-falootin'. So this stuff is a lot of fun as it reminds me of a cross between Doc Savage and Flash Gordon. It's more Space Fantasy than Science Fiction I suppose, but whatever it is, it's pretty fun to read. For this experiment I've picked CALLING CAPTAIN FUTURE which is the second book in the series. Though I've read several stories so far, this one really hits all of the great genre hotspots: a Sargasso sea of space with a conglomerate of standed ancient space ships, some of which are inhabited by tentacled, blood-thirsty aliens, a romp on Pluto's frozen surface and moons, chased around by hairy dinosaurs, wacky aliens, mad scientists, and a "Legion of Doom"!